Tuscaloosa, AL. — The Arts Council of Tuscaloosa will present “Between the Clouds” at the Dinah Washington Cultural Arts Center Feb. 7 – 28, 2014. The exhibit will feature works on paper in watercolor, mixed media and pencil by artist Bryce Speed in The Arts Council Gallery. Bryce Speed was born in 1978 in Collins, MS. 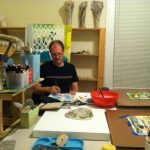 In 1999, he earned a BFA in Painting and Drawing at the University of Mississippi, and in 2005 he graduated with an MFA in Painting from The University of Alabama. He has taught at the University of Nebraska at Omaha and Central Community College in Columbus, NE and is currently an instructor at The University of Alabama. The artist’s work has been included in numerous exhibitions in several states over the past few years. 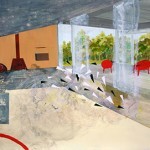 In 2006 and 2011 his work was selected for publication in New American Paintings, Southeastern and Western editions. In 2009, he exhibited new work in a show titled “The Great Wave” at PS 122 Gallery in New York, NY. He exhibited at the Nebraska Governor’s Mansion and the University of Nebraska at Kearney in 2011. 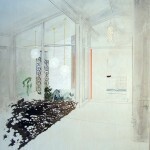 His work will be included in a three-artist exhibition at HEREart titled “Suburbia” in New York, NY in 2014. Speed’s work is represented by Modern Arts Midwest in Omaha, NE. “Between the Clouds” will open with a reception on Feb. 7 at 5 p.m. during Downtown Tuscaloosa’s First Friday event. The Arts Council Gallery hours are 9 a.m. – noon and 1 p.m. – 4 p.m. on weekdays and noon – 8 p.m. on First Fridays.